Shuang’s paper on the genetic basis of cell-to-cell heterogeneity in growth rate and acute-stress tolerance has been published in PLOS Genetics. Vincent Debat and Arnaud Le Rouzic have put together an excellent special issue on canalization for Seminars in Cell & Developmental Biology, including Kerry and Federica’s article clarifying and re-thinking the concept of genetic canalization. Postdoctoral fellow Joyce Kao has produced a general-audience video on how (and why) we use flies to study cryptic genetic variation. Paper from Zoe Assaf in Dmitri Petrov’s lab on our collaboration to study rates and patterns of mutations in flies has been published in Genome Research. Naomi’s paper using high-throughput microscopy to map genetic variation in yeast-cell growth (and its variability within strains) has been published in Genetics. Congratulations to (Dr.!) 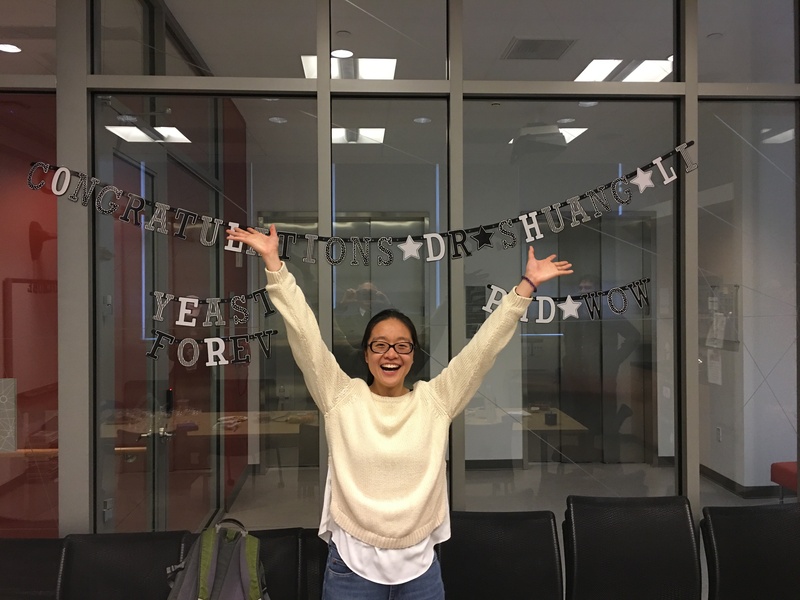 Shuang Li for successfully defending her thesis. Stay tuned for some excellent papers on the mechanism underlying cell-to-cell heterogeneity in yeast-cell growth. The Genetics Society of America has made available recordings of talks given at The Allied Genetics Conference earlier this year in Orlando. Joyce’s talk on cryptic genetic variation in flies, Shuang’s talk on nongenetic heterogeneity in yeast, and Kerry’s talk on the interaction between Hsp90 and genetic variation in yeast are all available on YouTube. Cell Systems profiles select papers in the journal’s monthly Principles of Systems Biology series. They just published Kerry’s blurb on her PLOS Biology Hsp90 paper. Kerry’s paper showing that Hsp90 does not tend to buffer the effects of new mutations on yeast-cell morphology, but that selection preferentially retains buffered alleles, has been published in PLOS Biology with an accompanying Primer article by Schell, Mullis and Ehrenreich. On this occasion, we note with sadness the passing of Susan Lindquist, whose work has inspired us for a long time. Mark was in the first cohort of recipients of the new MIRA (“Maximizing Investigators’ Research Award”) grant mechanism from NIGMS. This five-year grant supports the lab’s work on variation in complex traits, rather than a specific project. Mark is thrilled to be part of the MIRA “experiment” and thinks it’s one of the most important changes in NIH funding strategy in many years. Joyce Kao was awarded a Ruth L. Kirschstein NRSA postdoctoral fellowship!